Genre: FPS. Other versions: PC; PS3. Considered by many one of the pioneers of the first-person shooter, Doom embraces its 20th anniversary with a collection of all three games and two expansions. Strangely, the prime focus of this package is Doom 3, despite containing all three games, with revamped visuals and other tweaks. Doom 3 was polarised upon release, as though it’s technical accomplishments and scary moments were lauded by some, others dubbed it a dated shooter with closet scares. It all comes at a discounted retail price, but does it do enough to be called the ultimate Doom experience? Though slightly different with each instalment, the basic concept remains through the series: you play as a Marine under the UAC who must prevent the invasion of Earth from Hell and its creatures. As a collection of all the previous Doom games, you get Doom 3, its expansion Resurrection of Evil along with a new campaign called The Lost Mission, and Xbox Arcade versions of Doom and Doom 2. It certainly represents good value for money, especially when you factor in the bargain price point. Doom 3 and its expansions will probably give you a little over 10 hours of gameplay, while Doom 1/2 should increase that to 15 or more and this doesn’t factor in the unlockable Nightmare difficulty for the Doom 3 campaigns, meaning BFG offers more content than some full-priced shooters do. "I've got a feeling I should be in Half-Life"
Time can be a cruel mistress though, and the eight-year-old Doom 3 does feel dusty compared to recent shooters. Even upon its 2004 release, competing against the likes of Half-Life 2, it was considered by some as simplistic. Doom 3 really boils down to moving through the ruined military facility while shooting anything in your way. Progression is entirely linear, and the shooting becomes somewhat stale as you close towards the campaign’s conclusion. Doom 3 can also feel breezy on most difficulties, as small enemy encounters and dumb AI make gunplay relatively easy. That being said, Doom 3’s shooting action is still pretty potent, as powerful weapons and satisfying combat save Doom 3 from becoming mediocre. There’s also an uncomfortable atmosphere which lingers, as you explore the dank and dark crevices of the ship, even if you don’t pee your pants throughout. Expansion Resurrection of Evil actually feels riper with age. New weapons and enemy types shake up the action considerably. Though not wholly original, additions such as a gravity gun and Artifact powers which can slow down time, for example, just make the action more varied, and there’s great fun to be had experimenting. Tougher foes, including some devilish new enemy types, also make the action more intense. The Lost Mission, a whole new chapter created for BFG Edition, sits uncomfortably between D3 and RoE. The combat is easier and there are less enemy types, but elements such as the gravity gun still come into play. Sadly, it can be finished in little over an hour, making it feel like an afterthought. Doom 1/2 have been ported with modest success, as while the dated structure and forced 4:3 format can be off-putting, additions like leaderboards and online multiplayer make both games worthwhile. All three campaigns benefit from a mix of solid mechanics and flaws. The strong, responsive gunplay you come to expect from Id Software remains intact, and the tight-quarters environment and grotesque enemy design make combat frantic and exciting. But at the same time, there are a few changes which actually hinder rather than improve. The lack of control options seems bizarre, while the addition of a mounted torch reduces a significant amount of tension from the original release, as you no longer need to choose between vision in the dark or the ability to shoot. The addition of a checkpoint system is also jarring, as the game pauses to save your progress. That being said, Doom 3 provides a dose of old-school fun which, while not mind-blowing, is refreshingly straightforward. Doom 3’s greatest asset was its looks, with visuals which dropped jaws all over, and BFG comes with some adjustments to ensure it doesn’t look too dated. Texturing is a little sharper, lighting is improved and a silky smooth frame rate ensures the action is fast paced. That being said, you can only spray so much paint on a 2004 release before the rust shows through. Animation is pretty solid still, but plenty of the game doesn’t look so hot. The audio holds up better. Strong gun effects, combined with fleshy demons, add a satisfying punch to combat. The voice acting is okay, if a little bland at times, while the sparse music adds a small amount of tension, though odd effects like random moments of heart-beats are pretty spooky. 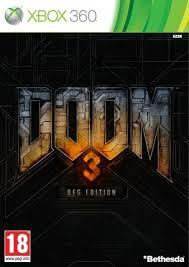 Doom 3 BFG Edition presents a solid package for those who have yet to invest in the series. It’s not the top dog it once was, as repetitive shooting and easy action can make the game feel lacklustre. But at the same time, the visceral shooting and straightforward blasting can feel refreshingly old-school, as scores of other shooters bog themselves down with mediocre stories and other elements. Doom 3 is a shooter, from top to bottom, and that is both its biggest strength and Achilles heel. That being said, Resurrection of Evil provides a good couple of hours of fun, and the addition of the first two games is also welcome. With a cheaper price point and plenty of hours of fun, those who don’t mind a little more brawn than brain will find BFG worthwhile.